The Mint family of plants falls under the order known as Lamiaceae. According to the Montana Plant Life website, there are as many as 3,200 types of mint species around the world, with most being perennial in nature. The mint plants typically have a four-sided square stem and leaves that grow opposite each other on the stem or in a whorled pattern around it. A fair proportion of mint plants have a pleasant aroma and many kinds are important medicinally. Spotted horsemint (Monarda punctata) is shrubby and possesses many branches. The plant can achieve heights up to 4 feet and the leaves and the stems have fine hairs covering them. Spotted horsemint has 1- to 3-inch-long lance-shaped leaves and produces small flowers with bracts that are lavender to pinkish in color. The Floridata website states that the leaves of spotted horsemint have the same aroma as oregano, and some people will use them to flavor recipes. The species is a native plant in the eastern United States from Vermont to Florida and as far westward as Texas and Minnesota. Spotted horsemint prefers an area that gets full sun but can withstand partial shade in hotter climates. The plant will spring up from seeds, or you can divide the root clumps of established horsemint. This mint will draw in butterflies and is a good choice for a wildflower garden. Peppermint (Mentha x piperita) grows from creeping underground rhizomes and can spread over a very large area if left unchecked. Peppermint has a familiar menthol smell to its leaves and stems when you crush them and this member of the Mint family has many uses, including medicinal, culinary and ornamental purposes. Peppermint grows no taller than a foot in most cases and has leaves that can be as long as 3 1/2 inches. The minute pink-purple flowers resemble small spikes. Full sun conditions or some shade is agreeable to peppermint, as long as the ground is damp. In fact, peppermint can handle very wet soils that drain poorly. Peppermint is an ancient cross between spearmint and watermint. The plant grows readily from pieces of its rhizome root system. Plant peppermint in your garden and regularly pick the leaves every two weeks to use in herbal teas or dry them for a potpourri collection. To control the spreading nature of peppermint, plant it in a clay pot that you then bury to within an inch of its top rim. Always keep in mind that peppermint will quickly spread and can become an invasive species if it escapes your garden and starts growing into the wild. Lemon balm (Melissa officinalis) features light green crinkled leaves with noticeable teeth on the edges. The egg-shaped foliage smells like lemon when you crush it and the yellow flowers are 1/2 inch wide. The flowers are not at all conspicuous, making the lemon smell of the leaves the main reason to grow this perennial mint. Hybirds such as All Gold have yellow leaves, while Variegata has yellow markings on the dark green surfaces. Lemon balm can grow to 3 feet tall and is a native species of northern parts of Africa and southern sections of Europe. 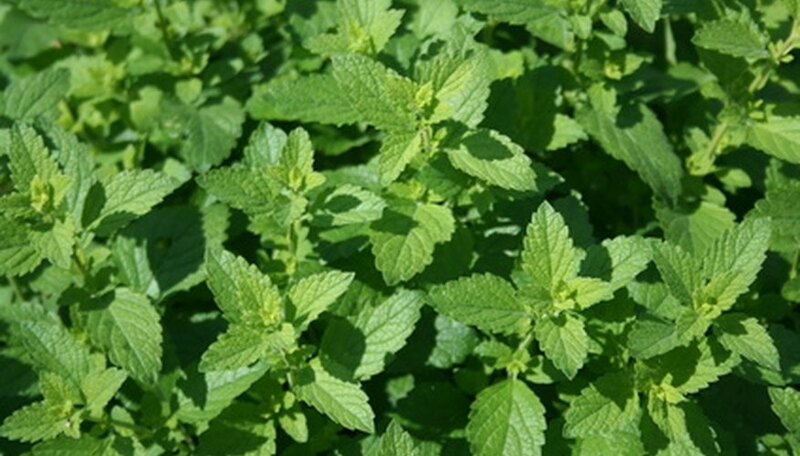 Lemon Balm goes well with full sun and it will grow in sandy soil as easily as in well-draining good earth. Lemon balm seeds are so small and slow to germinate that you will have better luck by dividing the root clumps and planting them. What Herbs Are Good to Grow in Kansas?